Systems and Signals Group: How conserved are protein-protein interactions? And why would you want to know? How conserved are protein-protein interactions? And why would you want to know? A comparison of biological sequences from multiple species shows a great deal of evolutionary conservation. An overall question of interest is the following: what is the connection between similarities in biological sequence between species and similarities in the function of their components and cells? We started to think about this question in the specific context of proteins: the construction blocks of cells which are specified by a sequence (of amino acids). If two human proteins are known to physically interact (stick to each other) will their equivalent (homologous) proteins in mouse physically interact? (To say that two proteins are homologous means that they are similar through common evolutionary descent: in some sense, they are the 'same' protein). The answer, it is often assumed, is 'yes': a fairly similar sequence that specifies the protein makes for a fairly similar function of that protein. Indeed, partly because new sequence data is being generated at a much faster rate than any other type of data, it is common practice to 'transfer' functional knowledge (such as interaction partners) from a functionally characterised protein to its unstudied matches in other species. But is this legitimate? If we know the interaction between proteins in the network of the green organism what can we say about the interactions of similar proteins in the blue organism's network? An answer could also shed light on more theoretical questions. - If only small changes in sequence can lead to new interactions between proteins, then this could be a fast evolutionary mechanism to generate new functions. - Homologs are also found within a species - do these maintain the same interactions (a form of robustness), or rapidly lose them (release from evolutionary selection)? Our paper just appeared in PLoS Computational Biology with the title "What Evidence is There for the Homology of Protein-Protein Interactions?". 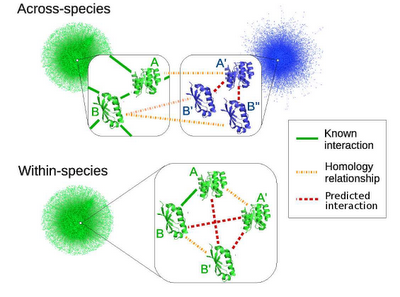 Our results returned some expected conclusions: more closely related species have more conserved interactions; the more stringent the definition to consider two proteins as homologs, the more conservation observed. An overall conclusion was that, at definitions of homology/similarity frequently used in the community, conservation of interactions is low, and hence 'transferred' functional annotations should be used with care. We also compared the transfer of interactions between and within species, and found within-species transfers were less reliable than between-species transfers. Using our method we also made some guesses as to the rate at which protein-protein interactions are lost through evolutionary time and about the total number of interactions that are present between all the proteins in an organism.